[Sauk City, WI]: Arkham House, 1941. First edition. Small previous owner's name label affixed to lower right corner of front free endpaper (below the written inscription), lower right front corner bumped, a very good to nearly fine copy in a very good dust jacket with rubbing to front flap fold, mild rubbing and shelf wear to spine ends with a touch of loss to upper spine end, small closed tear and crease along rear panel bottom edgeage, small chip to lower left rear corner and age tanning to spine. (18637). Octavo, cloth. 1115 copies printed. Signed inscription by Derleth on the front free endpaper. 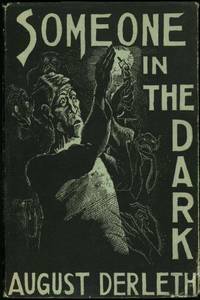 The second Arkham House book and Derleth's first collection of supernatural fiction. These stories are almost all culled from the pulps, many from Weird Tales. Barron (ed), Fantasy and Horror 4-47.